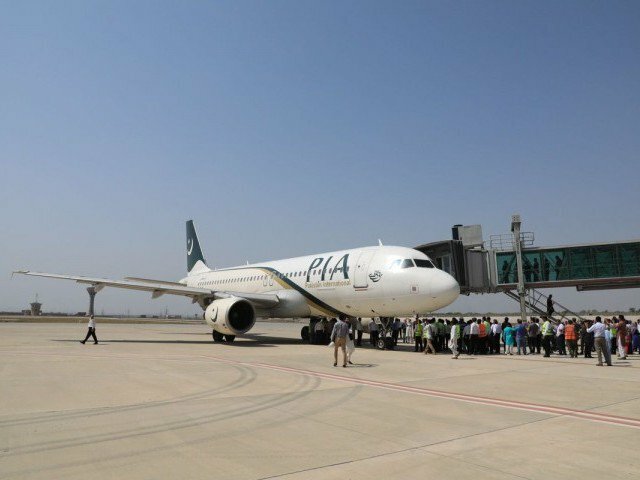 ISLAMABAD: The first Pakistan International Airlines (PIA) flight landed on Saturday at the federal capital’s new international airport as part of the preparations for the formal inauguration of Pakistan’s largest airport on April 20. An A320 aircraft took off from the Benazir Bhutto International Airport (BBIA) at 12.30pm and landed at the new Islamabad International Airport at 1pm. PIA will make a historic landing at new Islamabad int’l airport. PIA ‘s A320 will take off from BBIA at 1230PM on PK9001 and will land at NIIA at 1PM. It will be the first mock up flight at the new airport. Purpose of PIA mock up flight is to assess the operationability of NIIA. It was the first mockup flight at the new airport. The PIA president and CEO Musharraf Rasool were present on board the mock flight to assess the operational ability of the new airport. On Friday, PIA introduced a new logo and design to include a painting of the Markhor, the national animal which is endangered, on the tail of the aircraft. PIA planes will still have the country’s flag, accompanied by ‘PIA’ written both in Urdu and English. The old Benazir Bhutto International Airport will be transferred to the new airport between April 19 and April 20.